Learn how Ubuntu Server 11.04 can be set up as an iSCSI storage server using simple Linux command line operations. with multiple roles. When you initially install Ubuntu Server, you're given a list of options including OpenSSH, DNS, LAMP, Mail, PostgreSQL database, Print, Samba, Tomcat Java and Virtual Machine host. Using virtualization it is possible to host different roles as individual virtual machine (VM) instances, making it easier to perform updates and system reboots without taking other services down. For a storage role, you can set up a file server using Samba. But, in today's enterprise environment you're more likely to find network-attached storage (NAS) using iSCSI, and Ubuntu Server 11.04 is up to the task. A NAS iSCSI storage server is not a role configurable from the install menus, but it's not hard to set up. The key to setting up a server for this storage role is a combination of hardware (a lot of disk space), plus the right software modules and configuration. In this tip I will cover what it takes to get everything configured properly and how to manage the system once setup is complete. Webmin is a great tool for managing any Linux server system. 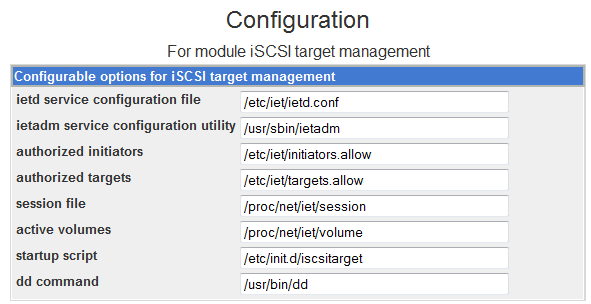 But, a module needs to be added to manage the iSCSI target configuration. Adding Webmin modules is simple: open a Web browser and go to webmin.org and click on “Third-Party Modules” and search for iSCSI then copy the link and paste it into the Webmin add module screen. This provides access to all the iSCSI and storage configuration options necessary to manage your system. This shows the files and script commands that Webmin uses to do its configuration job. Webmin provides access to the underlying storage hardware to include RAID configuration, disk partitions and full control over Logical Volume Management (LVM). With the addition of Webmin you can avoid command-line configuration of Ubuntu Server 11.04. This Linux operating system distribution is good for general-purpose server functionality, including a low-cost storage server.